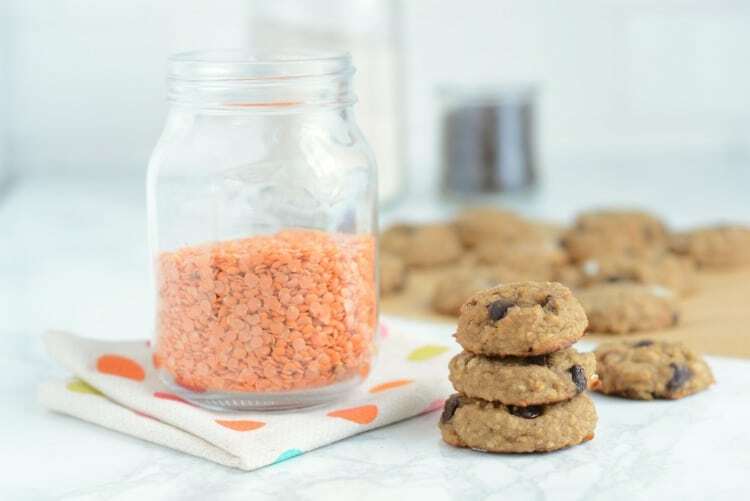 Red Lentil Cookies are made with wholesome ingredients and can help your family become more familiar with the taste and texture of lentils. When my kids are learning to like a food, I’m all about baby steps. Baby steps can be mashing up beans and spreading a thin layer on a burrito instead of adding them whole. It could be dicing up mushrooms to add to ground meat to warm everyone up to the idea. Or it could be baking lentils into cookies. Because everyone loves cookies. I love the idea of reducing our carbon footprint as a family by eating more plant-based meals. And lentils are SO GOOD for us. They’re rich in protein and deliver lots of fiber, something most kids (and adults) don’t get enough of. My husband and I already love this Turkish Red Lentil Soup. The kids aren’t at “love” level with it, but will both eat it. The fact is, lentils just aren’t their favorite. Hence, these baby steps cookies. 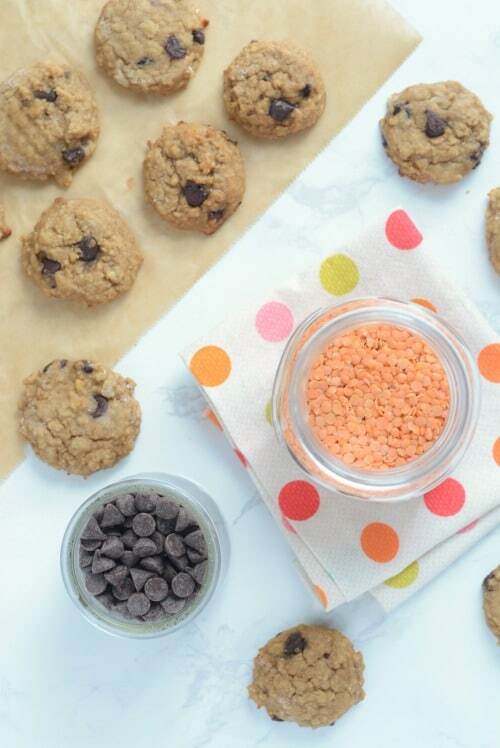 For these cookies, I combined the more unfamiliar flavor and texture of lentils with old favorites (peanut butter and chocolate chips) in a lightly sweet and filling cookie. Does this recipe absolve us from serving lentils in other ways to our families? Nope, but it may help encourage our kids to try them in other ways down the line. 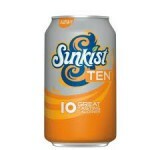 Just be sure to tell your kids these have lentils in them! Better yet, make this recipe together with your kids. Sneaking lentils (or mushrooms or beans) into food doesn’t accomplish anything in the long term. 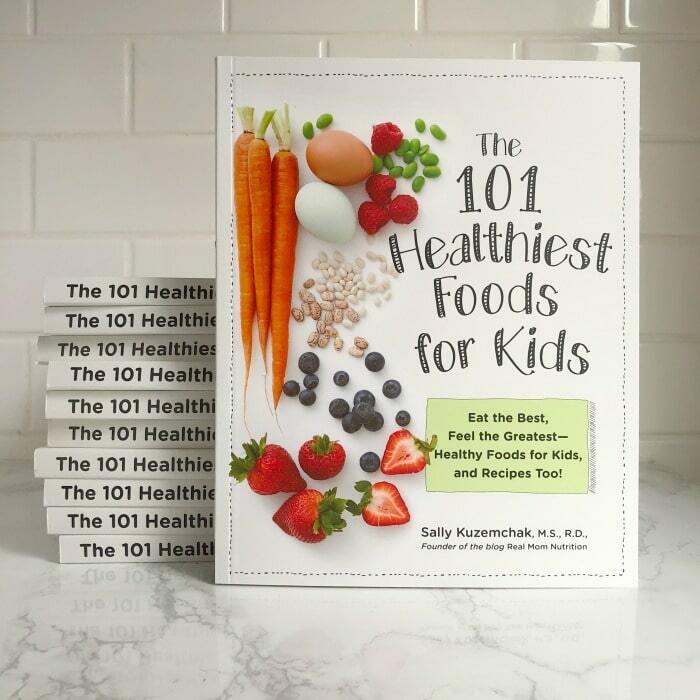 The recipe is in my new book The 101 Healthiest Foods For Kids, which is out TODAY! 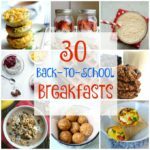 It features profiles on 101 different foods that are great for fueling kids’ bodies and minds, 26 easy recipes (like this one) that you can make with your kids, and tons of advice throughout on feeding kids. If you order through this link, I’ll send you a free Try New Foods printable chart to use with your kids. Rinse the lentils and place in a small saucepan. Cover with 1 1/2 cups water and bring to a boil. Cover, reduce the heat, and simmer for 10-15 minutes, or until most of the water is absorbed and the lentils are soft. Transfer the lentils to a small colander to drain away excess liquid. 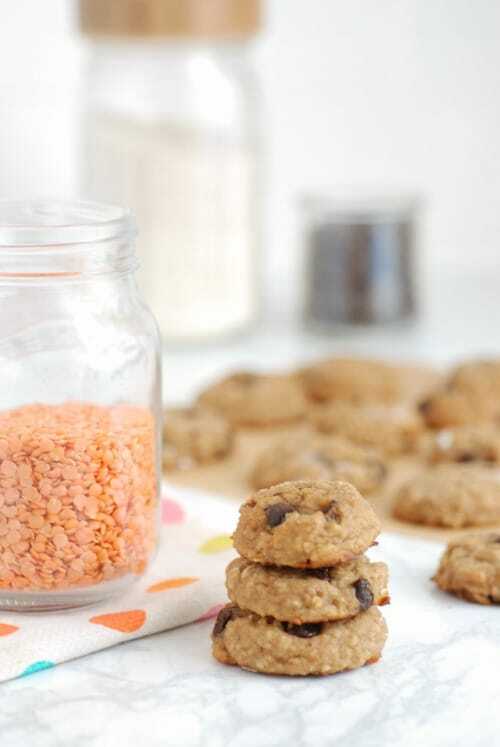 In the bowl of a food processor, combine the lentils, peanut butter, 1 cup of the oats, the flour, egg, applesauce, maple syrup, vanilla, baking soda, and salt and process until well blended. 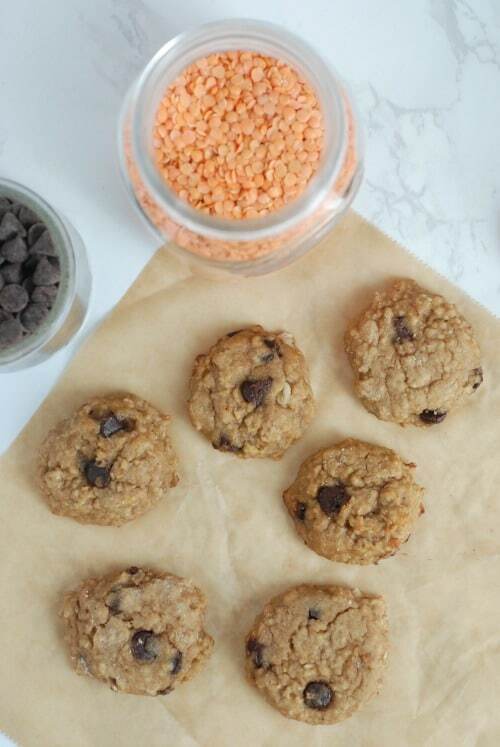 Add the remaining 1/2 cup of oats and the chocolate chips and pulse a few times just until incorporated. Cover the bowl and chill the mixture in the refrigerator for 30 minutes. Preheat the oven to 375 degrees and line a baking sheet with parchment paper or a silicone baking mat. Drop heaping tablespoons of batter onto the baking sheet (a small cookie scoop is a great tool for this job). 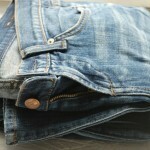 They won't spread, so don't worry about spacing them far apart. 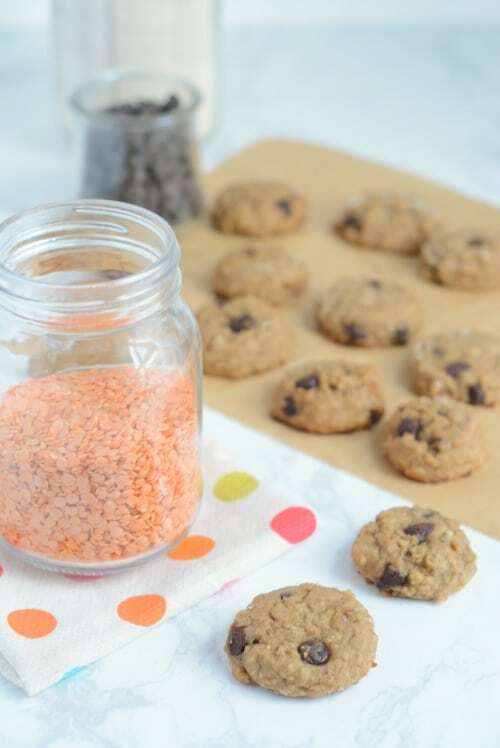 Gently press down the tops of the cookies with the bottom of a small glass or measuring cup dipped lightly in flour. Bake for 12 minutes. Remove to a cooling rack. Keep leftovers refrigerated in an airtight container. Can’t wait to try these! Just bought some red lentils at Whole Foods. Wow delicious recipe! As a Nutritionist i can say this food is 100% healthy and nutritious. Thank you so much for sharing this recipe, I will must try to home. I made these! They are interesting. My son ate two right out of the oven without complaint. I am bringing them to work tomorrow to celebrate Registered Dietitian Nutritionist Day! Thanks, Sally!